Hitachi Data Systems has a new enterprise all-flash array and a faster hybrid array, doubled flash drive capacity and updated its Storage Virtualization Operating System (SVOS). 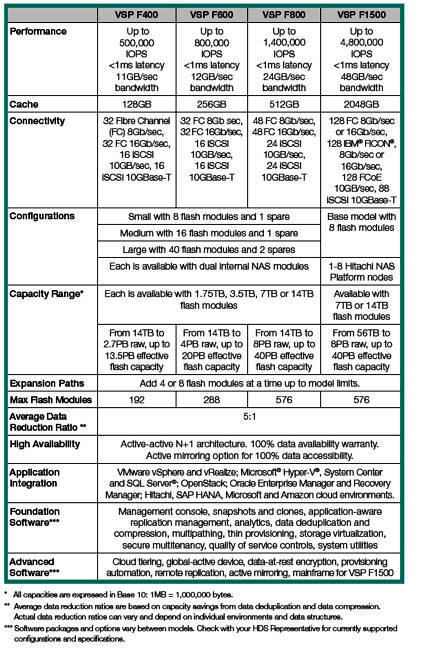 Its Virtual Storage Platorm F (VSP) products are all-flash arrays with the G series being hybrid - both flash and disk. The new, high-end VSP F1500 quadruples the cache, doubles the previous high-end systems bandwidth and more than triples its I/OPS. That should give HDS sales reps more ammunition to fight Dell EMC VMAX, HPE, IBM and Infinidat high-end arrays. HDS says the VSP F1500 has superior price/performance value, and is for enterprise customers looking to consolidate IT across block, file and mainframe operations. HDS does not use SSDs, instead building its own FMDs. Previously the FMD capacities were 1.6TB, 3.2TB or 6.4TB. Now they are 1.75TB, 3.5TB, 7TB and 14TB. The refreshed FMDs use MLC (2bits/cell) NAND, not TLC (3bits/cell), and have SAS interfaces, not using PCIe. Older, gen 1, 1.7TB and 3.2TB FMDs have a 6Gbit/s SAS interface. All the other and later drives use 12Gbit/s SAS. The gen 1 drives use 25nm 32GB, MLC flash chip technology. Gen 2 (FMD DC2) drives with 1.7TB, 3.5TB and 7TB capacities use 19nm 64GB MLC flash. The latest, third-generation 7TB and14TB FMD HD drives use 15nm, 128GB MLC NAND. The new FMDs have built-in, in-line compression using a VLSI engine and a derivative of the LZ77 algorithm. Compression can be distributed and managed across a system's set of FMDs. There is an enhanced Flash Translation Layer and this, HDS claims, together with the compression, delivers up to 80 per cent data reduction (typically 2:1) at 10 times the speed of competitors. It says this is because each FMD provides its own compression engine, giving HDS the ability, it claims, to easily provide five times, even ten times, the data reduction processing capabilities of other, traditional all-flash arrays. Dell EMC added inline compression to HYPERMAX, the VMAX OS recently. HDS says these FMDs have the ability to prioritise application I/O requests over background tasks such as garbage collection, to minimise potential latency. FMDs come in 12 drive/2U trays, with more than 338TB effective capacity per tray, and HDS claiming I/OPS performance is up to five better per FMD than enterprise SSDs. A possible fourth-generation FMD could use TLC flash chips with an NVMe interface to increase both capacity and I/O performance further. This time next year 30TB 3D TLC NAND SSDs will likely be available and HDS could build gen 4 FMDs from the chips used in such drives. The VSP G1500 is the sixth member of the G series range, and the high-end system. It is a go-faster G1000 with 4.8m I/OPS - 20 per cent more than existing G1000. It can run workloads up to 40 per cent faster. The latest v7.0 version of SVOS, the VSP operating system, has an improved flash-aware I/O stack. It has enhanced QoS to prevents workloads from monopolizing bandwidth and dedicates data reduction services to workloads for more predictable latency than other all-flash arrays. There is new adaptive data reduction, which provides deduplication and compression within SVOS for 2:1, 5:1 or greater capacity savings. SVOS 7 can offload compression to FMDs to lower latency and scale data reduction beyond other all-flash arrays. SVOS, QoS and VVOLs are integrated so that specific resources can be allocated to virtual machines, including FMDs, so that the VMs get dedicated FMDs for managing compression. There is support for all-flash cloud tiering, which provides transparent file migration to private or public cloud storage for more predictable costs and faster transitions to all-flash. Hitachi has Dynamic Tiering and also Tiered Storage Manager software. The firmer promotes/demotes data, at sub-LUN or page level, in tiered storage systems, according to its IO acccess rate. The most active data is moved to the highest-performance tier. Less active data gets down-tiered. An active flash mode moves suddenly active data via synchronous promotion to higher-performing tiers in real time, with HDS claiming that access latency changes from seconds to sub-second times. 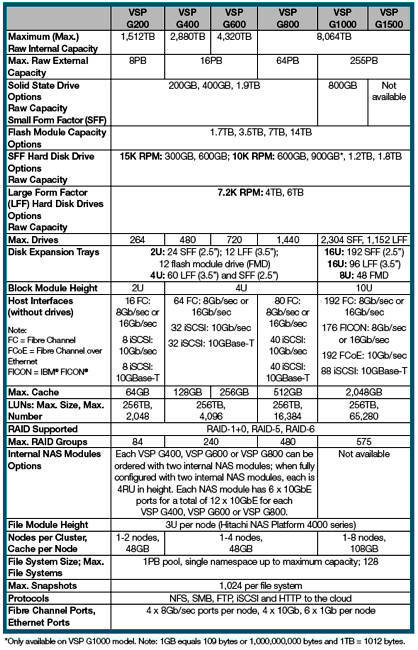 Pages in flash memory that exceed thresholds for heavy write-I/O can be demoted to preserve flash endurance. Tiered Storage Manager can create different classes of storage pools, varying price, performance and availability, and then facilitate non-disruptive data migration between storage tiers and externally virtualised storage resources to match changing application requirements. User-defined policies can drive this. HDS VSP arrays have in-array tiering and tiering to "the cloud" via a data migrator feature - "the cloud" meaning, for example, on-premises and Hitachi Content Platform (HCP) or the Azure and Amazon S3 public clouds. Data can be migrated from VSP G400, G600 and G800, plus the Hitachi NAS Platform 4x00 to such targets. Migration can be policy-driven, down to folder, file type and access time points. There are also new versions of Hitachi Storage Advisor, Automation Director and Infrastructure Analytics Advisor software, which enable customers to more easily implement new SVOS 7 functions and reduce process complexity. Existing VSP G1000 customers can upgrade to the G1500 via data in place, non-disruptive migration.